DEBORAH CROMBIE: On Sunday night, September 25th, a new series, Pan Am, premieres on ABC. Set in 1963, it stars Christina Ricci, and "follows the lives of stewardesses circa 1963 and their bouts with passion, jealousy and espionage at 30,000 feet." (I'm quoting the show's Facebook page.) "Stewardesses," mind you, not "flight attendants." Remember them? If you don't, the show will bring it all back, especially those adorable sky-blue uniforms and the little pill-box hats. And girdles. They had to wear girdles! It all sounds like complete fluff--super soapy Mad Men in the Sky--but the show is directed by Thomas Schlamme of The West Wing, and written by Jack Orman of ER. Not only that, but for all you former ER fans, this season will feature a four-episode guest arc with Goran Visnjic (Dr. Luka Kovak). Be still my heart. But pitter-patter aside, all this retro-sixties air travel glamor started me thinking about the way we used to dress for plane flights. Can you imagine that we used to actually "dress up" to get on a plane? 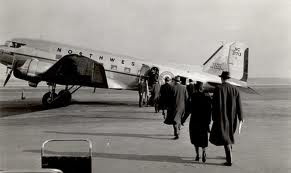 (My first plane flight, for the record, was circa 1966--a Dallas to Houston hop on a prop plane for my brother's wedding, on which I disgraced myself by having to use the sick bag. Remember those? These days I am, fortunately, a much better flyer.) Even in the mid-seventies, when I made a number of trips to Europe with my parents, we took our in-flight ensembles very seriously. My mother was horrified at the thought of not being well-turned out on a plane. These days, I'd wear pajamas on a transatlantic flight if I could get away with it. What about you, Jungle Reds? Do you miss the days of glamor in the skies, when air travel was an adventure rather than a trial? JAN BROGAN: I still can't believe I used to smoke cigarettes on an airplane. 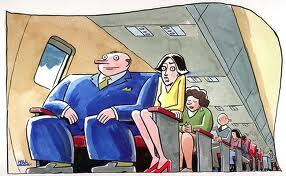 But while I miss leg room - and will pay extra for it -have to point out that air travel is also way more affordable. No matter how much glamor there may or may not have been (wasn't most of it in our heads anyway, because the experience was rare?,) you were always cooped up on an airplane for an ungodly amount of time. At least now it costs less. But of course, I suffered from a really bad plane phobia for a long time and now I don't. So for me, personally, there's been a lot of progress in air travel. HANK PHILLIPPI RYAN: Oh, it used to be such fun! My sister and I would fly to see my father (When I was maybe, 10? And Nina 7), and instantly scoop up all the little salt and pepper shakers from the dinner tray. Remember? They had real food! And we thought those little bottles of alcohol were SO exotic. We dressed up, of course. And I adored the flight attendants, and wanted to be a "stewardess" for such a long time. I mean--they were gorgeous, had those cool uniforms, and were so worldly, and seemed to be in charge. Now I make sure I have a shawl and flat shoes and non-smelly food. And I still am impressed by the flight attendants. They are so patient, and so brave. RHYS BOWEN: I remember the first time I flew to Australia the plane made about six stops along the way and at each one we had to get out and go into a lounge. And every segment they served another meal and more alcohol. My husband John was an airline sales manager so we got to travel first class everywhere, but had to dress accordingly--me in suit and high heels, the kids as if going to church. I liked getting dressed up. I liked the glamor of flying. I liked the linen table cloths and the caviar (sigh). And friends coming up to the plane door to see us off and my kids sitting up with the pilot and helping to fly the plane. When John was laid off reality struck and the kids stared in horror. "You mean we have to fly economy?" they asked. It's been going downhill ever since. JULIA SPENCER-FLEMING: Rhys, that makes me laugh. "You mean we have to fly economy?" And also helps put in perspective my nostalgia for flying in the pre-deregulation days. Yes, it WAS nicer, and people did dress up instead of wearing pajama pants and flip-flops, and you actually looked forward to the "jet set" experience...but I wasn't the one paying for the tickets back then. Hank, my mother had a whole collection of those china salt-and-pepper shakers! When I think of the glamor of air travel, I think of my mom back then - a slim, stylish officer's wife in a miniskirt and long red hair. (I quickly add she's still slim and stylish.) Even back in a time when there were porters and skycaps all over, my mother perfected the art of packing for a week in a single Samsonite Fashionaire. ROSEMARY HARRIS: We didn't fly anywhere when I was a kid - it was more like piling into the Chevy and driving to upstate NY. How glamorous you all were! Don't remember my first flights - probably Freddie Laker to Europe. Anyone remember him? I'm sure I wore jeans and wanted to look adventurous. Nowadays i try for Kate Moss chic - black, denim, shawl, slipons, large carryon. I think it works, although I suppose there's always the chance I think I look like Kate Moss and I really look like a bag lady. It is nice to fly first class or business - and I upgrade whenever I can - but I'm a pretty good traveler and don't really care, particularly if my husband is with me. What I do confess to loving is Priority Access. Not having to wait in line is such a good thing! LUCY BURDETTE: Ha, ha, you girls make me laugh. Hank, you'd be the best stewardess ever. And Ro, you couldn't look like a bag lady if you tried! We didn't fly when I was young either, we drove everywhere in a station wagon with no AC, two German shepherds, and a pop-up trailer towed behind. The only flight I can remember really loving was an accidental upgrade to first class years ago from Hawaii to New York. It was one of those planes where the seats reclined completely into a real bed. Heaven. We took a bike trip in Hungary this summer and I lobbied hard for an upgrade--told my sister-in-law we were doing that so she could pile on. "I'm not that big," she said. "I don't need that much room." I'm not that big either, and I'm here to say that has nothing to do with it! Being treated like a reasonable human is what I crave. And I DO look like a bag lady when I travel--it's all about comfort and as close to PJ's as I can get:). DEBS: I lost my Priority Access this last year--missed it by 500 miles. Didn't have immediate trips planned so didn't want to pay the ridiculous fee to re-up. I am SO regretting that . . .
What about you, readers? Do you still like flying the friendly skies? Oh, and be sure to come back, as we have a great week! We have the multi-talented Crescent Dragonwagon to tell us about Fearless Writing, and cooking; thriller writer Sophie Hannah; and on Friday, Louise Penny! Wonderful stories! I don't LIKE flying, but I do it a lot, because my elderly mother is in California. And I have traveled so much around the world - Brazil, Japan, West Africa - that I'm used to it. I'm appalled not so much by the PJs but by the shorts and flip flops. I find planes so cold that I always wear shoes and socks and bring a shawl (and my own pillow for my back). On my frequent trips to the West Coast I now really have my system down. I get a non-stop flight and an aisle seat. I bring a sandwich plus my little bag of roasted almonds and dark Dove minis. Then I haul out the netbook and write for a couple of hours. It's a great way to move the WIP ahead. Edith, you have it totally figured out! Aisle seat, mos def. And headphones. Not necessarily any music on them, just headphones. I as ust on SOuthest, and I must say it was hilarious. The "take a moment on give your attnetion to he flight attendant" speech was so hilarious, that everyone listened. The guy said: "In case of an emergency, the oxygen masks will drop from the ceiling. Put the elastic strap over your hard, stop screaming, and put the plastic mask over your nose and mouth." When I was a kid, flying was for rich people - period. I didn't fly anywhere until I had my first job in TV. My Lexington, KY, TV station had the contract for University of Kentucky football games, both home and away. I was on the remote crew to operate the Chyron, the graphics computer that does scores and "lower thirds." We were headed for University of South Carolina. The station's GM asked who on the crew had never been on a plane before. The show's director had given up his first class seat next to the GM for any newbies for the first leg from LEX to ATL. So, for my first flight, the GM put me in the window seat, explained all about the takeoff and the landing gear, etc. Of course, when we connected in Atlanta, I was returned to my "true" place in Coach. :) So sad. But, after that, I never was a nervous flyer. That night, we all ate at Greek restaurant in Columbia, SC. Another new experience for the woman who'd grown up down the street from tobacco fields. I remember having souvlaki. For the next football season, the station's bean counters decided that flying the crew out and putting us up in a hotel room wasn't cost effective, so the station leased a Lear jet from a coal company to transport us out to the away games and back home again in the same day. Nowadays, each region has its own remote TV production trucks, so stations and networks lease the locals. I flew just this weekend, a direct flight from Manchester NH to Detroit and back on one of those awful little 50-seat Delta planes. On the way out our seats were in Row 12, right in front of the john. Ugh. Lots of foot traffic, no ability to recline the seat. We were in Row 7 coming back last night. Better, but still very close quarters. Woe betide you if you get stuck with a stranger for a seatmate on one of those planes. One heroic flight attendant took care of all of us, clad in a wash-and-wear outfit. Nothing like the glamour days of old, but navy blue synthetic doesn't show the dirt/spills they must deal with all day. As for me, I have a flying uniform that involves as little metal as possible -- no buttons or belt -- and a vest with zip pockets that goes through the security scanner. And Hank, yes, yes, yes on the headphones. A decent bit of music can get me through a lot. Edith, ALMONDS! Nuts are definitely the key to flying well. I buy a pound at the start of a trip. Gets you through late arrivals when there's nothing to eat, too. I fly a lot. Booking flights in the months earlier I forgot all about summer thunderstorms. NEVER book an afternoon (or later) flight out in the summer or like me you'll be the only one checking through security at 2 AM for your delayed 6 PM flight scheduled to leave at 3. Great stories. And I definitely agree about Hank being the best stew ever! My first flight was in the mid-70's, when I flew to New York for business. I was a dress buyer for a small chain of stores that specialized in small sizes and petites, so got thrown directly into midtown Manhattan after a wild taxi ride from La Guardia. But before all that could happen we flew the one-hour flight from Cincinnati to NYC, with breakfast served on china and with actual silverware. Plane travel has gotten to be more like cattle car transport these days, in comparison. The TV show was great fun, and I look forward to watching it every week, if for no other reason than to sigh with nostalgia! Flight delayed but time made up. Nice flight attendants. Empty seat next to mine. Bliss! Hi from London, everyone, where it is shockingly warm. I have a nasty cold and I went to bed last night at 8:30. Did anyone actually see "Pan Am?" How was it? I have a set of twelve demitasse cups and saucers from the old Braniff Airline. Bought them in an estate sale for cheap. I have no clue if they're worth anything but I think they're cool! Flying is a pain, figuratively and literally, especially in the wallet! The cost of luggage and now the rumor of paying for carryons has me thinking that driving isn't all that bad! I watched the Yanks-Sox game which refused to end! I was almost glad when Scott Proctor came in. BTW does anyone else think that Jacoby Ellbury looks just like Juliana Margiules? has anyone ever seen them together??? And what would we Red Sox fans do right now without Ellsbury! I was watching Masterpiece Mystery - a particularly good Inspector Lewis. I'm hoping Pan Am can be streamed off the Internet. I read a review that said it was terrific... I think in the Boston Globe. This post reminded me of my girlhood best friend's mother. We were in awe of her because before marriage she was one of those glamorous stewardnesses! She belonged to a sorority of ex-stewardesses called "Clipped Wings," which I always thought was hilarious. Every once in awhile she'd pulled out her albums, and man, she fit the bill! I accidentally insulted her once by saying, "Wow, you were so pretty!" Who remembers the novel, COFFEE, TEA, OR ME? Also, do you remember when you saw your first male "stewardess" on a flight? It seemed so, somehow, wrong at the time. Hah! Lisa, Coffee Tea or Me! Wow. I can totally picture the cover--I loved it. Ah, I went upstairs to read at inning 13--I could not BEAR it. Since they won, I figure now I can't watch any more games, because they were in trouble as long as I was watching. As a child, I remember thinking that the stewardesses were SO glamorous. Braniff even had designer uniforms that the women changed during the flights--I never saw that, but I remember wanting to. But the poor stewardesses were definitely targets for all the overt sexism of that era, and as much of a pain as air travel has become, I can't imagine they'd want to go back to that. 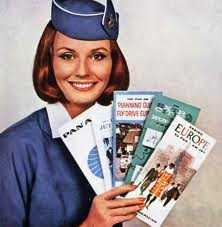 I want to see the TV show Pan Am only if it's truthful about what the era was like. One thing I DON'T miss about flying these days is free alcohol on transcontinental flights. I don't mind paying for one glass of horrible wine if I really want it--well worth not spending ten hours next to someone getting blind drunk on the free drinks. I had some awful experiences with that over the years, including one London to Dallas flight where a guy assaulted a flight attendant who refused to serve him.